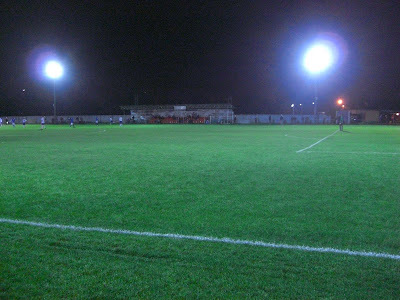 My fifty-ninth stadium of 2011 was on Tuesday 6th September 2011 at Goldsdown Road in Brimsdown, London. The match was Enfield 1893 vs. Hatfield Town in an F.A. Cup Preliminary Round Replay. Goldsdown Road is about 500 yards from the Brimsdown railway station in north London. The ground was built for Brimsdown Rovers in 1956 who played there until 2010 when they merged with Enfield 1893. This club then resided at the ground until 2014 before moving elsewhere. Goldsdown Road is now occupied by Brimsdown FC who formed in 2013. The ground has one all-seater stand running alongside the pitch on the south side of the venue. This has just under 150 seats and looks like a work in progress with a sheet of tarpaulin covering the back of the stand from the elements. Opposite this on the north side of the ground is a covered standing area next to the team dugouts. The rest of the ground is general uncovered standing behind the barriers on the edge of the playing surface. The venue itself is fairly spacious for this level of non-league with a decent clubhouse and cafeteria by the main entrance. There are also various football pitches in the surrounding grass areas next to the stadium. The game was an F.A. Cup Preliminary Round Replay between Essex Senior League side Enfield 1893 and Spartan South Midlands Premier Division side Hatfield Town. The first half was a pretty turgid affair with little in the way of quality. The only thing of note was the home side being reduced to ten men after just 18 minutes when their last defender brought down a Hatfield attacker after losing the ball to him. The game got better in the second half and Enfield took the lead with 15 minutes to go from an overhead kick. Just when it looked like they'd be going through to the next round Hatfield headed home in injury time to send the tie into extra-time. Early on in this the away side grabbed the deciding goal to win the game 2-1.